PAWTUCKET, R.I.--(BUSINESS WIRE)--Apr. 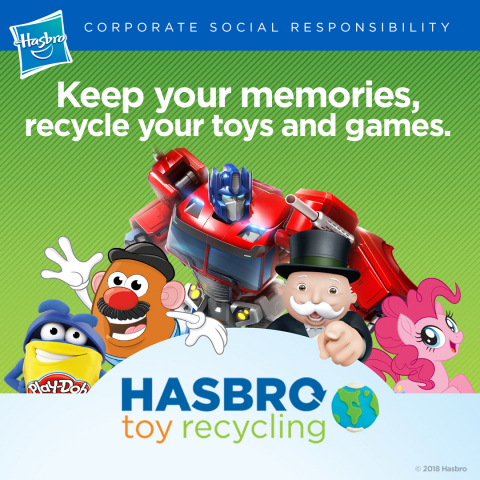 16, 2018-- Hasbro, Inc. (NASDAQ: HAS) announced today that it is launching a new, industry-leading, toy and game recycling pilot program with TerraCycle, a global leader in product recycling. During the pilot program, consumers can collect and send their well-loved Hasbro toys and games to TerraCycle, who will recycle them into materials that can be used in the construction of play spaces, flower pots, park benches, and other innovative uses. In 2018, Hasbro is piloting the program in the contiguous U.S. In honor of Earth Day, consumers in the contiguous U.S. can visit www.hasbrotoyrecycling.com to sign up for the free recycling pilot program starting on April 16, 2018. Once participants sign up, they can collect and box up their toys and games, print out a free shipping label and send their box to TerraCycle, who will sort and recycle the products. The pilot program is open to all Hasbro toys and games, including face-to-face games, plastic and electronic toys, action figures, dolls, plush, and more. This program builds upon Hasbro’s longstanding commitment to environmental sustainability. Through Hasbro’s Sustainability Center of Excellence, the Company strives to reduce its carbon footprint and continuously improve its environmental performance across every aspect of its business. Hasbro focuses its environmental efforts in three key areas: reducing the environmental impacts of products and packaging, partnering with vendors to source and distribute Hasbro products in an environmentally conscious way, and minimizing the environmental footprint of operations. For example, earlier this year, Hasbro announced that it will begin using plant-based bio-polyethylene terephthalate (PET) for blister packs and plastic windows in its product packaging starting in 2019. This step is one of many advancements the Company has made to enhance the sustainability of its packaging over the past decade. Additional actions include eliminating wire ties in 2010, replacing polyvinyl chloride (PVC) with PET in 2013, and achieving 90 percent recycled or sustainably-sourced paper for packaging and in-box content in 2015. In 2017, Hasbro adopted How2Recycle® labeling on packaging for U.S. and Canada, which helps to provide clear on-package recycling guidance to consumers. Reduce greenhouse gas (GHG) emissions by 20 percent. Hasbro ranked No. 3 on Newsweek’s 2017 Green Rankings, which assesses the 500 largest publicly-traded companies in the United States on overall environmental performance. The Company was ranked No. 1 on the 100 Best Corporate Citizens list for 2017 by CR Magazine and has been named to the 2018 World's Most Ethical Company® by Ethisphere Institute, a global leader in defining and advancing the standards of ethical business practices, and a distinction the company has earned for seven consecutive years. To learn more about Hasbro's CSR and sustainability efforts, visit www.hasbro.com/csr and read our CSR Report, Playing with Purpose.